Combine 1/2 of the grape juice, lemonade, and strawberries in a blender. Whirl until smooth and pour into drink container. Repeat steps 1 and 2 with remaining juice, lemonade, and strawberries. Add soda and stir well. Pour into 8 fancy plastic glasses. Add a cherry to the glass for garnish. Variation: You can substitute regular grape juice for white grape juice. Add more soda if you want a less slushy drink. Use plastic champagne glasses; they look great and won’t break. Stir together club soda and grape juice concentrate. Pour into two soda bottles. Cap tightly and chill. Serves 8 to 10. In a tall glass, mix the seltzer and orange juice. Slow pour the grenadine into the center of the glass, allowing the syrup to settle on the bottom. Garnish with the orange, lemon, and cherry, stacked and skewered with the toothpick. Serves one. Mix the syrup, cranberry juice, and ginger ale in a tall glass. Open the umbrella and slide the cherries on the handle. 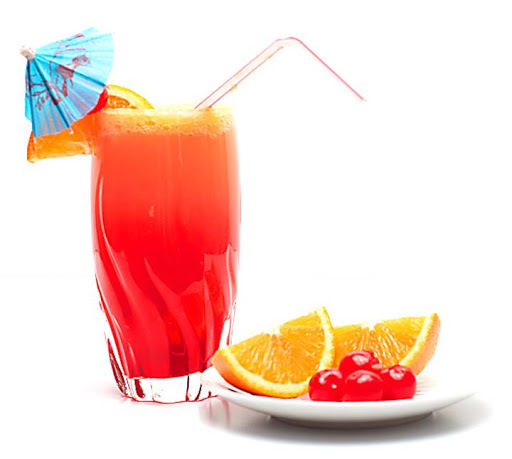 Balance the umbrella on the glass rim in front of the orange slice. Serves one. In a tall glass, mix the papaya and pineapple juices and the ginger ale. For the garnish, use a small, star-shaped cookie cutter to cut star shapes from lemon and lime peels. Slide the slices of star fruit onto the glass rim. Serves one. Click here to tell us how much you charge to work on New Year’s Eve. What are your favorite recipes for kids for New Year’s Eve?